SoundHound Inc. turns sound into understanding and actionable meaning. SoundHound believes in enabling humans to interact with the things around them in the same way people interact with each other: by speaking naturally to mobile phones, cars, TVs, music speakers, and every other part of the emerging ‘connected’ world. Its consumer product, Hound, leverages SoundHound Speech-to-Meaning and Deep Meaning Understanding technologies to create a groundbreaking smartphone experience, and is the first product to build on the Houndify platform. The SoundHound product applies to music, enabling people to discover, explore, and share the music around them, and even find the name of that song stuck in their heads by singing or humming. Through the Houndify platform and Collective AI, SoundHound aims to bring voice-enabled AI to everyone and enable others to build on top of it. Its mission: Houndify everything. 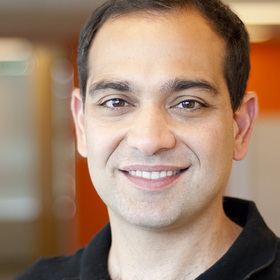 Keyvan Mohajer is the founder, president and CEO of SoundHound Inc. where he leads the company’s management, corporate strategy and operations. He is also the principal executive responsible for SoundHound Inc.’s technology development, including for Hound and Houndify, the world’s fastest and most accurate voice technology. Keyvan has a master’s and Ph.D. in electrical engineering from Stanford University.